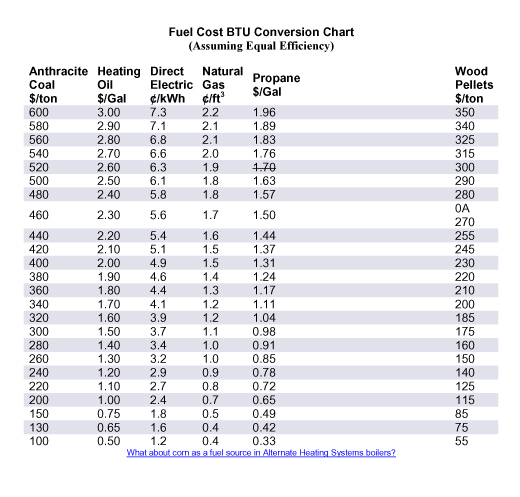 The table below compares the cost of historical fuel sources. Alternative energy sources are only included indirectly under the assumption that alternative energy sources such as wind and solar power are typically used via the electricity that they are configured to produce. Note that the price of electricity can vary widely. Check the price of Anthracite coal in your area. Find that price in the Anthracite Coal column below. In the row corresponding to that coal price, you will find the prices of other heating fuels necessary to match the BTU/h output to price ratio for coal. 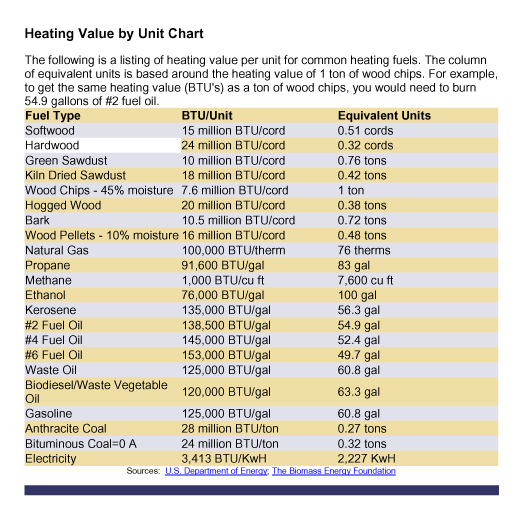 If coal costs $130 per ton, to get the same amount of energy (BTU/h) for the same cost, heating oil would have to cost $0.65 per gallon and propane would have to be $0.42 per gallon. Information from US Dept. of Energy.